Active meditation is the solution for those who don't have the time or patience to sit still and wait for enlightenment and peace. 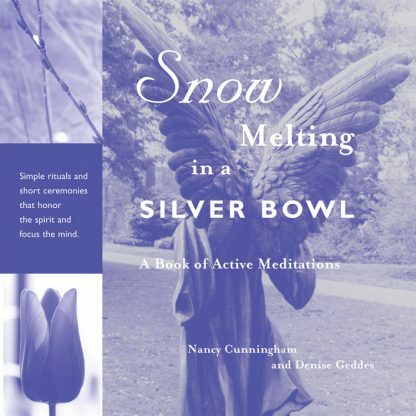 Snow Melting In A Silver Bowl is a collection of activities designed to focus the mind--if only for a moment--to see the spiritual in the physical world. Active meditations are ceremonies of "intention"--the universal spiritual practice of simply paying attention to the inner and outer worlds. Author Nancy Cunningham helps readers choose a prop--or props--that represents a physical element that appeals to one of the five senses. She then offers steps to get in touch with a universal energy that brings about a shift in consciousness and perception. The active meditations collected in the book include ceremonies, rituals, celebrations, observation, tangible visualization, and dramatized prayer. Snow Melting in a Silver Bowl offers a variety of ceremonies and rituals for special events, seasons of the year, and even mini rituals designed for everyday use. * A baby-naming ceremony renews and affirms life. * A spring breeze refreshes body and soul. * An orange slice becomes a way to access creative "juices." * A candle placed before a loved one who has passed on creates a time- and space-defying connection. The meditations are illustrated with the work of photographer Denise Geddes' evocative images that capture the soul of everyday objects.